John Varvatos’ marriage of soft pastel hues and electric masculinity is a dichotomy worth emulating. Touches of dandy by means of accessorizing (i.e. the scarf tucked into the taupe blazer) are microscopic pieces of evidence in a larger declaration of sorts. For the men of today, style is free of the limitations of yesteryear. It is expansive and what that fact communicates is an exciting new landscape to play within. Amid this framework Varvatos’ stale hued cotton suit partnered with worn in boots and glossed with a lightweight scarf is an exemplary display. The interplay of feminine and masculine is the future of fashion for men of dapper. It is high time that we take notes from the greats and follow form. Style Advice: As pedantically described as the inspiration has been, the tools to deliver such a look is quite painless. 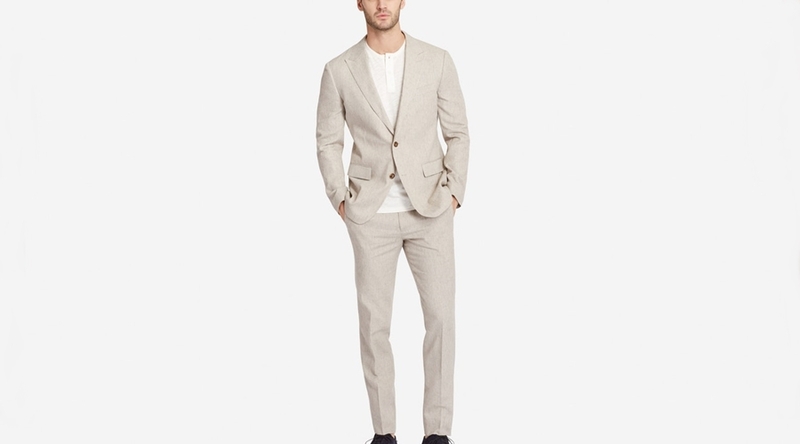 Bonobos has an exquisite summer offering, of which features a classically constructed Italian linen suit. 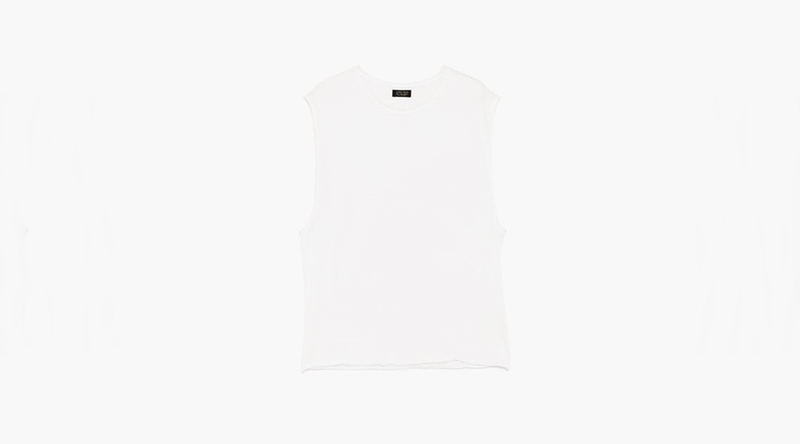 Zara’s ecru toned sleeveless t-shirt appears destined to be placed under such a suit. 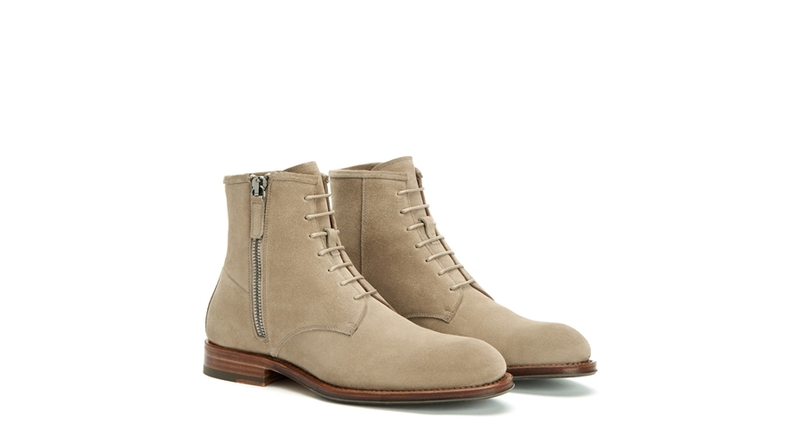 Aquatalia’s Victor lace up boots in taupe are versatile, masculine and 100% weatherproof (do not disregard bad weather during the summer). For the insertion of dandy Sandro has us covered with a paisley printed silk scarf. The Suit Supply duffle from last week’s column is pointedly transferrable to this look (if you do not already own it at this point). Now this is worthy of the term effortless. A skill men of dapper can attest to possessing! Must Have: The guy who has been following this column since winter should have a substantially diverse portfolio full of hot ticket items. A fair share has been necessity mentions (oxfords, backpack, sport watch, etc.). A few of our projected “must-haves” were a bit more surprising. Suggestions that intended to be a stepping stool to better and more notably expanded style (swim shorts worn as everyday shorts perhaps). Moving further in the lane of surprising are graphic sneakers. As an entity in commerce they are not novel. Think of Alessandro Michele’s Gucci and the adorned casual footwear that has swept the world. In regards to the average guy’s wardrobe it is a refreshing possible addition. Now any sneaker-head in attendance knows that graphic sneakers can cost a fortune, so start moderately with a conservative option that has similar or comparable design qualities. Printed cup soles from Converse’s Jack Purcell line is an apt find for the guy willing to invest in them. Industry Update: Seasonal designer collaborations with sportswear brands are transactional norms. Some of them are even permanent like Y-3 and Adidas. Specifically in the footwear market this often yields profitable results and ushers in unprecedented levels of social media frenzy. This season Supreme (the aficionados of limited release) are teaming up with sportswear behemoth Nike for a revamp of their classic Air More Uptempos in exciting new color ways (think flaming red and blinding gold). For the first time in Nike collab history, Supreme’s moniker will feature prominently on the shoe. As sneakers continue to become veritable when considering good style, they are transcending their athletic and urban terrain. The latter means that men of dapper and advancing style should take notice when two powerhouses in the apparel industry team up to determine what source of cool will dominate the zeitgeist next.